One of my favorite holidays to make cards for is Halloween. 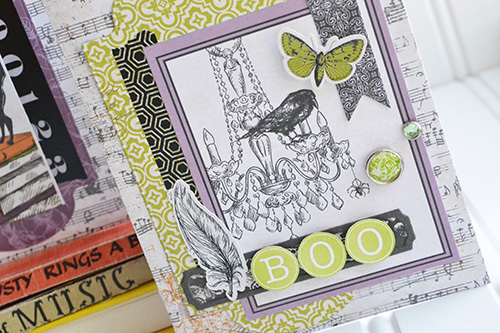 I love Halloween paper collections with the rich colors, the festive patterns, and the beautiful designs. 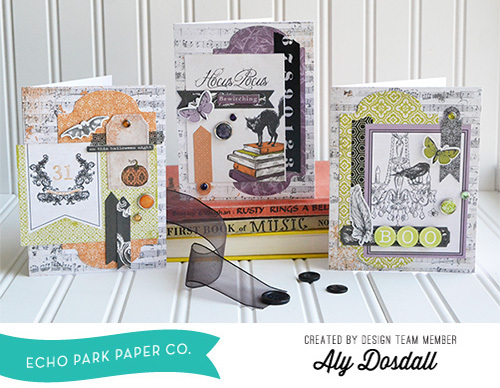 So I decided to make a set of Halloween cards with the spooky new Arsenic and Lace collection kit. I love the vintage Halloween engraving images in this collection, and the classic colors. So festive and fun! When I make a set of cards I like to coordinate not only the papers and colors, but also the design. I either stick to exactly the same design with the same papers, or I include similar elements with different colors and papers to tie the cards together. That’s the case with these cards—they don’t repeat exactly the same design and papers, but they do repeat enough of the same elements and shapes that you can tell they’re coordinated. These cards are all 4 ¼” x 5 ½”, and the foundation of each of them is a music paper background, a die cut frame, and a journaling card. Then I added washi tape to each one, a different die cut label (made using the new Label Set 3 Designer Dies ), some decorative brads, chipboard stickers, and element stickers. I love the dimension that the brads and chipboard from the collection add to the cards. Since one of the journaling cards didn’t have a sentiment already on it, I stamped my sentiment using the new Typewriter Alphabet Designer Stamps. I thought they coordinated really well with the style of the Arsenic and Lace collection. I adhered them to the card with foam squares to add a little dimension. 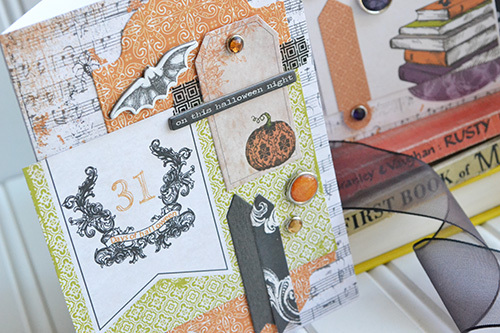 Design tip: I used a horizontal journaling card on one of my Halloween cards, so to make it fit in the design I trimmed ¼” off of the left edge of the card base and extended the journaling card edge ¼” over the edge of the card base. That way the card is still 4 ¼” wide and will still fit in the envelope. How about you? 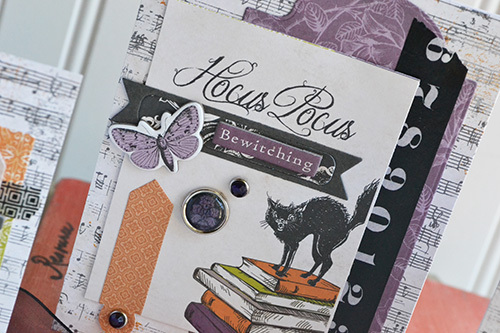 Do you like to make Halloween cards?